When college student (?) Henry (Sefton) invites his friend Bruce (Covington) to stay with him while in China, little did they know they would be staying at a run-down orphanage/Tai Chi center run by the aging Master Dragon (Chiang). While Dragon puts them through their paces during training sequences, the guys find a budding romance with Lin Lin (Jacqueline Lee) and Fay (Yan Bing Zhang). However, all is not right in the world of Tai Chi. 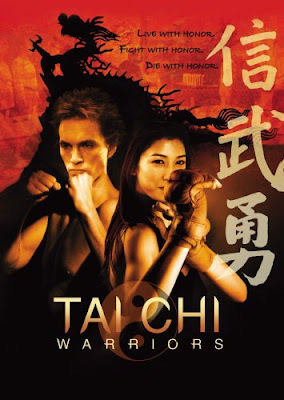 Master Dragon’s former rival is still bitter and angry about...well, their rivalry, and organizes a fight to the finish with his crew of fighters, a bunch of unscrupulous kickboxers led by Yuri (David Majuri). Will the power of Tai Chi prevail? 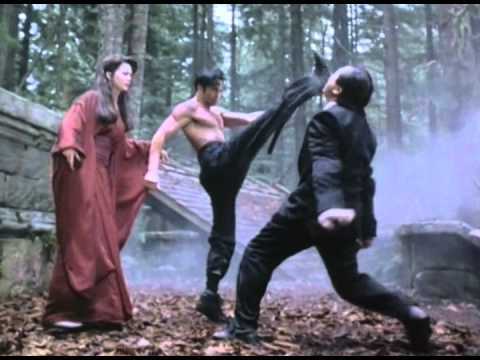 A monument to the concept of broken English (that is, when you can hear the muffled dialogue), Tai Chi warriors is a low-budget Martial Arts film that looks far older than it really is. Maybe older film is cheaper in Hong Kong, but even though the end credits state “October, 2004” (interesting that they would put a month), it looks like it was filmed in the early 90’s or perhaps even 80’s. The scene of “no rules bowling” was a standout, as was the bicycle fight, and there are some classically silly pretexts for fight scenes, but it’s all mixed in with some wire-fu and needless Godfrey Ho-style jumping around, plot-wise. Why a White college student in his early 20’s would be best friends with a middle-aged Black gentleman was never explained, but it must go to show that people were a lot less racist in the 80’s. I mean 90’s. Sorry, “2000’s”. The whole outing is rather impenetrable and even Master Dragon’s mullet couldn’t save it. Normally we list misspellings in the credits when we find them, but there are far too many this time around, so we’ll have to leave it to your imagination as to which of the many words were spelled incorrectly. Or you could watch the movie for yourself, but we wouldn’t necessarily recommend that. 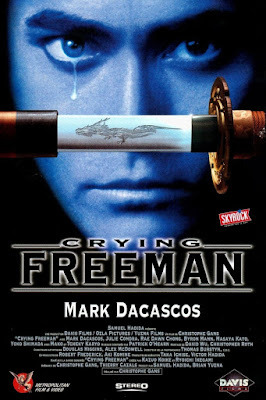 Crying Freeman is an excellent film that everybody should see. How it compares to the original Manga or Anime we wouldn’t know, but as a film in its own right it succeeds brilliantly. In other words, you don’t really need to know the source material to appreciate this. Maybe it helps, but there’s plenty to recommend even if, like us, you were unfamiliar with its origins and background. Classily directed by Christophe Gans - known primarily for his Brotherhood of the Wolf (2008) - he balances sensitive and poetic passages that are downright painterly and beautiful with violent action setpieces involving everything from Martial Arts, gun-fu, blow-ups, and even a bow and arrow. Its artistic soul meshes well with the violence. The overall effect is intoxicating and adds up to be, we believe, a must-see. Since this is quite obviously a work where the filmmakers clearly had high standards of quality, the whole thing seems solid and professionally made on every level - writing, directing, and, notably, the cinematography. It’s all very solid, and it’s comforting feeling you’re in competent hands. 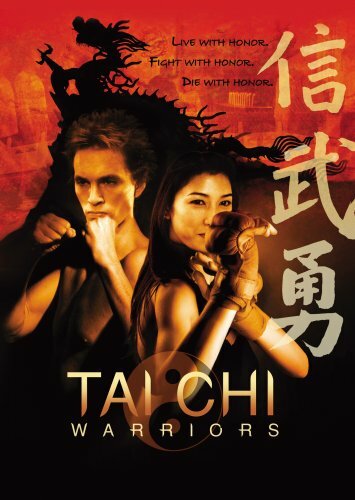 Naturally, fan favorite Mark Dacascos shines in the role that he was perhaps born to play. Co-star Julie Condra must have been impressed - they later married. They are backed up by some familiar names: Rae Dawn Chong and Tcheky Karyo are on board and acquit themselves well, though, interestingly, Condra and Karyo were overdubbed by Deborah Kara Unger and Ron Perlman, respectively. Other B-Movie stalwarts are here to be found too, such as Byron Mann and Jerry Wasserman (check out our Virtual Assassin review for the reason why we’re always pointing out these unsung actors) - and lest we forget fan favorite Mako. A little over an hour in there’s a bit of a lull, but that’s common and to be expected. That’s really the only criticism we have of Crying Freeman. And unlike most of its other brethren from 1995, this seems far more timeless. Shockingly - criminally - this didn’t receive a U.S. VHS release during the video store era, and only came out here on DVD quietly in 2008, and that release is now out of print. There are some fine international releases out there, and even a Blu-Ray now. But why this didn’t come out here when it would have done the most good for its reputation is puzzling and maddening. I guess it’s all part of the adventure of movie watching and collecting - you never know what you’re going to find, or where you’re going to find it. Occasionally you turn up a gem like this. Crying Freeman should be more well-known, especially in the U.S. We absolutely recommend this enjoyable winner of a film.